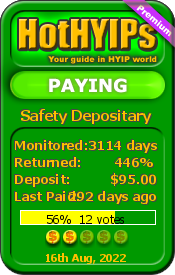 Safety Depositary - HYIP details - HYIP Monitor GoldPoll - The Best HYIP Monitor and Rating website. The Fairest High Yield Investment Programs Monitoring Service. ≡ Click here to check status of Safety Depositary HYIP on some other Monitors. Realizing a lot of fake votes around and the problem of the "selective payments", we strongly wish to help our members. That’s why we would like to announce our new GoldPoll Cares campaign. If you wish, You can make the status of your Bad Vote VERIFIED. Please leave your Login and Password for your account on Safety Depositary Program. In case Safety Depositary has no members area, please allow us to visit your e-currency account, we will check your Transactions History. Just leave your e-currency Account Number and Password (we will immediately check your History of Payments and let you know so that you can change your e-currency account Password back). By leaving your Login and Password for your account You allow GoldPoll to use it to verify this Bad Vote. You allow GoldPoll to contact this program on behalf of You for the possible resolving of your problem. You understand that GoldPoll isn't associated with Safety Depositary Program and cannot guarantee any result.